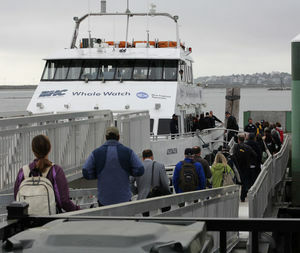 Cool temperatures and overcast skies could not keep 77 commuter ferry riders from smiling and laughing Monday as they boarded the Cetacea and looked forward to a summer of ocean views, coffee and cocktails. “It’s wonderful. I like everything about it,” said Revere resident Sheila Ercolini. “And the coffee on the ferry is good,” added Deborah Perates of Peabody. Debuting last year with a summer and early-fall schedule that exceeded a 10,000-passenger ridership forecast by 30 percent, the Lynn-Boston waterborne commute inaugurated its 2015 season at 6:30 a.m. with 38 early-risers aboard for the trip to Boston. Commuters board the Boston-bound ferry in Lynn Monday morning. Perates and Michael Conley of Marblehead commuted regularly on the ferry last year and said they don’t miss their former road-bound commutes to their Boston jobs. “It’s the ease of the commute and you are out on the ocean first thing in the morning. You can’t beat it,” Perates said. The ferry costs $7 for each leg of the 30-minute commute with seniors paying half price. Operator Boston Harbor Cruises honors Massachusetts Bay Transportation Authority Zone, although this week’s commutes are free. Enthusiastic word-of-mouth reviews about the ferry prompted Lynn resident Darlene Poplawski Monday to trade her old commute on an MBTA express bus for the ferry trip to Boston. “Everyone who takes it goes on and on about how good it is,” she said. She took a bus from her home to the Lynnway where the ferry dock is located on Blossom Street extension about two blocks off the Lynnway. U.S. Rep. Seth Moulton and state Rep. Brendan Crighton greeted Poplawski and other commuters dockside on Monday morning while city Economic Development and Industrial Corporation Director James Cowdell handed out Dunkin’ Donuts gift cards. Cowdell said city officials are looking for money to build a ferry terminal next to the dock. Crighton said the ferry’s popularity in 2014 “makes a strong case” for expanding its schedule by buying a boat dedicated to the Lynn-Boston route. The Cetacea does double duty as a whale watch boat. Kellie Kirkpatrick of Lynn admits she drank a little too much coffee and after-work beer during her ferry commutes last year, but she said the cross-harbor trip to Boston’s Central Wharf (at New England Aquarium) is the only way to commute. “It feels like you’re on vacation when you’re going to work,” she said. Swampscott resident Maria Frayler said the ferry eliminates the stress she felt driving to work and saves her car wear and tear — she also likes watching the sunset from her evening seat aboard the Cetacea.